For each of the properties displayed, we have included information regarding the acquisition of the property and whether the property is open to the public. If you are interested in seeing pictures from many of the different preserves, please visit the SLT Photo Gallery. All photographs were taken by Board Member Marian Howell. 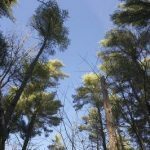 Features: The 365-acre parcel features a rich diversity of habitats including upland pine, mixed hardwood forest, shrub and wooded swamp, and freshwater marsh. The property also features rare flora habitat and several threatened and endangered species such as the Easter Box Turtle and the Four-toed Salamander. Location: Adjacent to SLT’s White Eagle property. The preserve was donated to SLT in 1986. Features: The 440-foot high radio towers, erected by the Marconi Wireless Telegraph Company in 1914, were used by the US Air Force during World War II. In 1956 all but one of the 14 towers were dismantled. The remains are still seen throughout the 109 acres. This property abuts other SLT preserves, including Barnabas, White Eagle, and Bow Bells and links through Barnabas to the Haskell Swamp Wildlife Management Area. Location: Along the former Railroad bed on the south side. 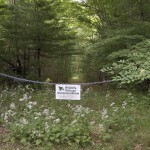 Sippican Lands Trust acquired the 248-acre White Eagle property in 2005 in partnership with the Town of Marion and other local conservation organizations. Features: White Eagle supports a rich diversity of habitats including upland pine, mixed hardwood forest, shrub and wooded swamp, freshwater marsh and cranberry bogs. The White Eagle property and surrounding land make up a 482-acre contiguous parcel of land that is home to several rare and threatened species including the Easter Box Turtle, the Spotted Turtle and the Water-will Stem Borer (a type of moth). 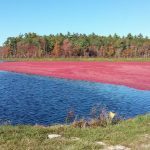 Part of the White Eagle property features a working 23-acre cranberry bog that has been continuously cultivated for over 100 years. White Eagle offers miles of trails for dog walking, hiking, biking, running, snowshoeing, cross-country skiing, hunting (by permission only) and other recreational pursuits. Eagle Scouts and SLT volunteers helped construct bridges and boardwalk on some of the trails at White Eagle. Location: The White Eagle property is located off of Route 6 in Marion. Turn onto Parlowtown Road across from the town cemetery and follow road until you reach the cul-de-sac. Veer left on the dirt road and follow past an abandoned cranberry bog on your right. Parking is available directly past the bog and along the dirt roadside. The kiosk is a short walk beyond. Brainard Marsh was generously donated to SLT through two gifts in 1983 and 1993. Features: The marsh is open to the public and is accessed through an opening in a stone wall along Delano Road. The path leads to the Weweantic River through woodlands, sandy fields and a white sand beach with views of the Weweantic River and out to Buzzards Bay and Cape Cod. A spur trail leads past a wet meadow and a small pond, where heron are frequently sighted. Location: It’s location is 1.5 miles down Delano Road from the intersection of Route 6, Point and Delano Roads, on the left hand side. Gallison Woods was donated to SLT in 1991. Features: Gallison Woods is an 11-acre property offering visitors a connection to the upper reaches of the Sippican River as it flows eastward and then south toward the Weweantic River. Several trails have been established affording the opportunity for a close-up encounter with a wide range of flora and fauna. 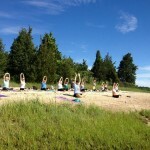 Location: Located at the end of Inland Road, off Route 105, just North of the I-195 overpass. Hagemann Woods is a 23.9-acre parcel of land acquired in 1998 from the Hagemann Family. Features: Hagemann Woods offers unusual rolling contours and includes forests of white pine, oak and red maple. The property has a myriad of walking trails, fire lanes, horse paths and animal tracks. This area of Marion was known as “The Great Swamp” for its extensive wetlands and past vernal pools. Native American trails traversed Hagemann Woods from the sacred Fall Harvest Campground at Great Hill to Sippican Harbor. Location: The parking area for Hagemann Woods is located off of Point Road approximately two miles south of the intersection of Route 6 (Wareham Road) and Point Road in Marion. This property was acquired from the Howland Family in 1995. Features: Quietly tucked into the southeast corner of Planting Island Cove lie almost 9 acres of serene and unspoiled refuge for shore birds and marine life. 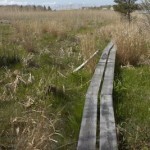 The walkway into the marsh makes possible an intimate view of osprey, terns, oystercatchers and ever-present seagulls. Low tide reveals the oysters, mussels, quahogs, and several crab types which populate the mud flats. Location: Point Road, about 2.5 miles from the traffic light on Route 6, on the right hand side. About 100 yards after Rogers Drive. The walk begins near #392 Point Road. Kenney’s Landing is named in memory of Hod Kenney, the former President of the Sippican Lands Trust Board of Directors, who worked diligently and passionately to protect and maintain land and open spaces around Marion. The 3.05- acre property features trails on both the property owned in “fee” by the Sippican Lands Trust and a Conservation Restriction that Sippican Lands Trust holds with the Town of Marion. Its combination as both a “fee” property and Conservation Restriction is unique in the Sippican Lands Trust’s conserved properties’ portfolio. Kenney’s Landing provides access to the upper reaches of the Sippican River in Marion. Location: Just under 1/2 mile North of teh 195 overpass on the right hand side. Turn right on Ichabod Lane. Follow to the end of the cul-de-sac. Osprey Marsh was donated to the Sippican Lands Trust in 2014 by Mary Howland Smoyer in cooperation with her children and her siblings, Edward Howland, George Howland and Meg Howland. Features: Osprey Marsh is a 19.8-acre parcel of protected upland woods, wetlands and marshland offering spectacular water views of Planting Island Cove. Future plans include building a fully accessible boardwalk at Osprey Marsh that will connect with the existing trail. Location: The Osprey Marsh parking area is located off Point Road approximately three miles south of the intersection of Route 6 (Wareham Road) and Point Road in Marion. Purchased by SLT in 1995. Features: This property covers 30 acres from Point Road down to Blankenship Cove. In summer several species of heron feed along the shore, including great blues, greens, and yellow legs, while in winter buffleheads, mallards, and swans abound. The protected diamondback terrapin lives here year ‘round. On a clear day Cape Cod, Martha’s Vineyard and the northern Elizabeth Islands can be seen. Special Note: In 2014 the Marion Community Preservation Committee accepted Sippican Lands Trust’s application requesting funds to rebuild the viewing platform at Peirson Woods. The $14,250 in funding from the Marion Community Preservation Committee was used for the replacement and “rehabilitation” of the existing viewing platform facility at Peirson Woods. Sippican Lands Trust is grateful for this generous community support. Location: Point Road, past Marion Public Golf Course on the right hand side. Generously donated to SLT in three separate donations, 1978, 1987, and 1991. 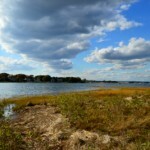 Features: The preserve totals under 2 acres and all lots are mostly marshland along the banks of Aucoot Cove. Generously donated to SLT in 1979. 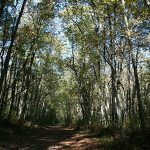 Features: This preserve consists of over 90 acres along the old railroad bed located in southwest Marion between Route 195 to the northwest and old RR bed to the southeast. It consists of uplands containing hardwood forests and wetlands. Location: It is adjacent to our Radio Tower and White Eagle preserves. Generously donated to SLT in 1994. Features: Consisting of about 5 acres. This preserve abuts both Cantella Marsh and Priestly Marsh. Location: Barzelay Marsh is located along the Weweantic River. Generously donated to SLT in 1991. Features: This property is about a half-acre on Sippican Harbor and features a small seaside marsh with limited human access but popular with shorebirds. Benson Brook consists of three parcels donated to SLT by Mary Clark in 1987 and 1992. The 12.92 acres of this property are located in southwest Marion. This property features a wooded wildlife habitat. These parcels are quite wet verging on swamps in spots. Bow Bells Parcels was generously donated to SLT by Mary Clark in 1987. The 19.03 acres of this property in southwest Marion are comprised of wooded wetlands with a few acres of uplands. Other features include small flowers, a stream, pine and hardwood. This lovely little marsh is at the head of Briggs Cove, adjacent to and viewable from US Route 6, provides excellent hunting ground to shorebirds throughout the year. This property is a saltwater tidal marsh located off Dexter Road. This property located off of Route 6 is comprised of wetlands and a wooded wildlife refuge. It contains a pond and bog which is home to great blue heron, red tailed hawk, chickadees, swallows and blackbirds. This property has no walking trails but is a great birding opportunity. Generously donated to SLT in 1996 by Raymond and Ruth Covill. Features: Donated to SLT in 1996 and contiguous with our Hood Property (donated in 1998). The property consists of mostly upland forest habitat. Location: Located just off south of the east-bound lane of I-195 and is bisected by Old Parlowtown Road. The Delano Parcel was generously donated to SLT in 1981 by Sarah Delano. This parcel is 15.13 acres located in southwest Marion. The majority of the land is between the Edison and RR rights of way and was known in the past as Bear Swamp. It is part of a larger combination of properties designated by the SLT as Aucoot Woods. It consists of upland and wetlands. This small island located at the mouth of Hammett’s Cove as it meets Sippican Harbor is accessible by land at low tide only. Mostly tidal salt marsh and beach gravel with critical water filter and excellent shorebird habitat. 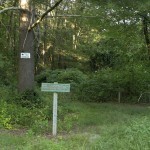 The Hermitage Trust Property is small lot located at the intersection of Route 6 and Hermitage Rood. A small path runs though the property from Hermitage Road to Little Neck Village. This property is wooded with wetlands south of and sharing a boundary with Covill Woods. This property contains 3 lots of uplands and a fourth lot which is a salt marsh with bordering vegetated wetlands along the coast of Hammett’s Cove. The Ludes Estuary was generously donated to the SLT in 1999. Features: The estuary is nearly 6 acres of woods and marsh located off Creek Road and contains a rare coming together of fresh and saltwater marsh where the creek meets the tides at the Briggs Cove end of Hammett’s Cove. Although no trails presently exist on the property, plans are under way to create trails and a viewing point on the property in the coming year. Location: Visible to the North as you go along Creek Road. This parcel is a small development parcel with uplands and wetlands. This parcel is a former bog left to return to its natural state. It has one boundary that is contiguous with Chace Bog. Priestly Marsh features a small tidal marsh and wildlife habitat. This small wooded and wet corner lot includes a 2889 square foot Town of Marion sewer easement in the northeast corner. Wooded lot down through marsh to Aucoot Cove. To be maintained as a wildlife habitat. Not open to the public as it is located on a private road. This parcel is a small coastal beach in developed area bought at a mortgage foreclosure auction. This property comes with a perpetual easement for a 5′ walkway for access across the neighboring lot which abuts Howland Marsh. It features a scenic viewscape and wildlife habitat. Donated to SLT in 1991. 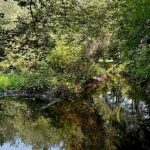 Features: Just off Route 6 on the western edge of Marion, along the banks of the briskly flowing Borden’s Brook, stand the remains of the Sparrow’s Brothers’ once-thriving shingle mill. The forge works, the blacksmith shop and other parts of the 10.4 acres complex burned to the ground in the early 1900s. Today weather worn stone vestiges of the skillfully designed enterprise are a reminder of our local heritage and the preservation legacy to which SLT is dedicated. This property also abuts Town of Marion protected open space, linking it with other contiguous lands, including SLT’s White Eagle and Cerkovitz Woods preserves. Location: 2.5 miles west on Route 6 from the traffic light at Front Street/Route 105, on the right/north side, between Rocky Knock Lane and Sparrow Lane. These 11 acres were a gift to SLT in 2003. Features: Historically, Stewart’s Island has played many roles in Marion’s lore. It’s recognized as a site inhabited by native Sippicans. The island has served as part of Marion’s once prosperous salt works industry. In the late 1800s it was the home of the Sippican Yacht Club, vestiges of which still stand on the town’s western shore just south of the inner harbor. Location: Visible to the south east from Silvershell Beach. This parcel of vegetated wetland and woods was donated for its conservation values in addition to prevent further density within a housing development. This 0.67 acre property is located in the heart of the village of Marion. Holmes Brook flows through the property to the harbor. The SLT plans to maintain it in its natural state to sustain the native wildlife of this property in perpetuity. This conservation restriction was donated by the Baldwins in 1998. Features: It is considered a visual easement on about 1.5 acres and does not have public access. Location: This property is located on private property, but can be viewed on Water Street. Features: The Beaton deal was the first large-scale conservation project in Marion and permanently protected 246 acres of productive cranberry bogs, upland forest, riverfront lands, a freshwater pond and wetlands. The deal, a bargain sale, included a fee simple purchase of approximately 100 acres by the Town of Marion to add to Washburn Park, a fee simple purchase of approximately 10 acres of riverfront by SLT, and SLT holds the remainder through a conservation restriction. The project helped protect Hammett’s Cove and Sippican River, while allowing for the continuation of agricultural activities. Location: Some of the bogs are visible along Point Road, and the riverside marsh can be seen from the East Bound side of I-195 as it crosses the Sippican River. This CR features a scenic viewscape of a tidal marsh and vegetated wetlands on Blankenship Cove which are a natural habitat of the Diamondback Terrapin. Restrictions on additional structures. Also note that the property is accessible only via a private road so there is no public access. Location: Just under 1/2 mile North of the 195 overpass on the right hand side. Turn right on Ichabod Lane. Follow to the end of the cul-de-sac. This CR is 60 acres of open space scenic views along the eastern shore of Sippican Harbor. Historically the 41 acre golf course has been open to the public since the early 1900’s and is Marion’s only public golf course. It is an English-style course, the only design of George Clifford Thomas in Massachusetts, considered by many to be the best English-style links course in the Cape Cod area. There are 15 acres of wetland within the CR. LMP includes preserving the natural, scenic, historic and open space values of the property. This conservation restriction was donated to SLT in 2000. Features: This nearly six-acre marshland habitat in the heart of the village has been placed under a conservation restriction specifically to protect the sensitive role it plays in the health of Sippican Harbor’s headwaters. It is home to a bounty of wildlife, plants, and tidal waters with marine life and offers an extraordinary vista of the inner harbor when coming in from Route 6 via Front Street. Location: On the left hand side of Front Street when heading towards the village between Daggett House and Tabor’s Center for Marine and Nautical Science.